They may not have lived longer, but they lived healthier than "ad libitum" monkeys. The term "ad libitum" deserves consideration here, and that's just what Gifford gave it. This new study from the National Institute of Aging (NIA) is being compared to a parallel study out of Wisconsin (from whence the photo below was taken). 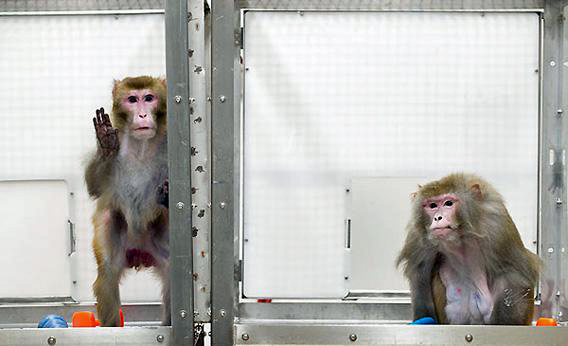 Rhesus monkeys: On the left is Canto, 27, on a calorie-restricted diet. On the right is Owen, 29, on a control "ad libitum" diet. From the Wisconsin National Primate Research Cener on May 28, 2009. Photograph by Jeff Miller. "While the Wisconsin control-group monkeys were allowed to stuff themselves, with the equivalent of an all-you-can-eat buffet for several hours at feeding times, the NIA monkeys were given a fixed amount of food. “You could view it as the Wisconsin monkeys were overindulging, like the rest of the American population,” says Rozalyn Anderson, a member of the Wisconsin team. Compared with their Wisconsin brothers, then, the NIA monkeys in the non-calorie-restricted control group were arguably practicing a mild form of calorie restriction—and that, Anderson suggests, might have made a difference." So, there is gorge-yourself "ad libitum," and there is rationed "ad libitum." Interestingly, the rationed "ad libitum" monkeys (who did not engage in CR), "seemed to be on track to live as long, or longer, than the Wisconsin calorie-restricted monkeys. Some of them were approaching 40 years old, previously the highest recorded age for Rhesus monkeys." "The NIA monkeys were fed a natural-ingredient diet, made from ground wheat, ground corn, and other whole foods; the Wisconsin animals ate a “purified” diet, a heavily refined type of food that allowed the researchers to control the nutritional content more precisely. Because the NIA monkeys were eating more natural ingredients, de Cabo realized, they were taking in more polyphenols, micronutrients, flavonoids, and other compounds that may have health-promoting effects." Furthermore, the NIA diet consisted of 4 percent sucrose — while in the Wisconsin diet, sucrose accounted for some 28 percent of the total calories." There's a lot more to know about the benefits of restricting calories. Indeed, "In both studies, the monkeys that ate less were healthier by a number of measures — and suffered far less from age-related disease." But even if CR is too demanding, there may be benefit in reducing sugar, and eating more whole foods. I wish there was a way to study these things that didn't involve putting animals in cages. Marion Nestle said she wasn't surprised. Give me a break. Even the researchers were surprised. I've grown to detest that saying "I'm not surprised" or its brother "No sh*t" It's like someone telling you how great they are. I hope you don't flag me for that word. At least I put an asterisk in it. So I guess you have to balance desire for longevity w/ interest in living in a constant state of hunger. Well, this study found quite the opposite, Melinda. Monkeys who were not calorically restricted were living as long, or longer, than monkeys who were ... that was the surprise. What you eat may be more important than how much you eat. There's quite an established CRON (Calorie Restriction with Optimal Nutrition) movement, as I'm learning. They say that, if you do restrict calories, the feeling of hunger subsides. I agree that it's a cost:benefit situation. For some, the cost of not eating what they want is too high for the benefit of better quality-of-life, less disease, and possibly longer life.